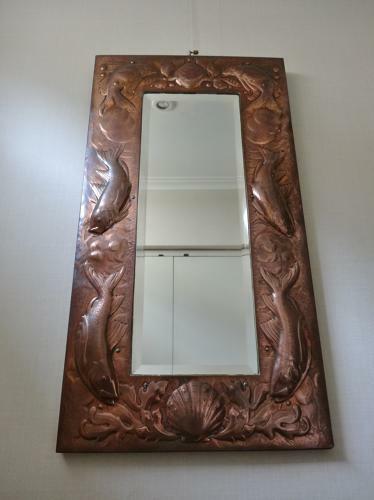 A rare good large sized Arts & Crafts rectangular copper framed Newlyn mirror with typical stylised fish among seaweed etc; c1900. The Bolitho family (still very much in existence today) were and still are one of the most prominent Cornish families. Indeed it was the local MP and landowner, TB Bolitho who provided financial help in establishing the Newlyn Industrial Class in 1890 by a group of Newly artists, including JD Mackenzie. Approx 27" by 14.5" overall.